Successfully Added VKworld 700x Android 5.1 Smartphone - 5 Inch 1280x720 Screen, Quad Core CPU, Smart Wake, Dual SIM, 400MP Mali GPU (Black) to your Shopping Cart. Looking for an entry level smartphone that features all the right functionality? Here it is. 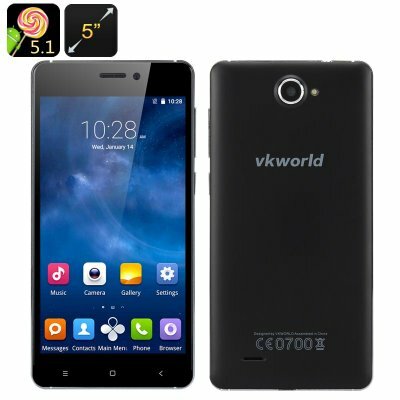 The VKworld 700x comes with an affordable price, a 5 inch HD screen, a powerful processor and 2 SIM cards. The VKworld 700x is a well-designed budget entry level smartphone for those seeking good functionality at an affordable price. So, if you don’t want to drop a large amount of money on a simple gadget - the VKworld 700x is a great option. The smartphone is well-made and comes with a high-quality 5 inch screen with a 3.0D curve and Gorilla Glass. Android 5.1 makes sure you have a friendly and efficient interface at your service. You can also hit the Play Store to add on more functionality with popular apps and tools. Despite the smartphone’s reasonable price, it comes with several high-end features. Smart Wake is definitely of note, as it lets you access some of the apps you use most often right from the locked screen. Simply draw a “C” to open up the Camera app or “E” for access to the web. The 2200mAh battery will give you plenty of talk time: up to 150 hours. There’ll also be 180 hours on standby. With 3G and two SIM cards, the smartphone also comes with great connectivity. You will also have two cameras to snap quick selfies or take pics of your surroundings. With 8GB of internal memory, you will have enough storage space, but the phone also supports a micro SD card for up to 64GB.